Top of my European wish list for as long as I can remember, Santorini is the stuff of dreams. 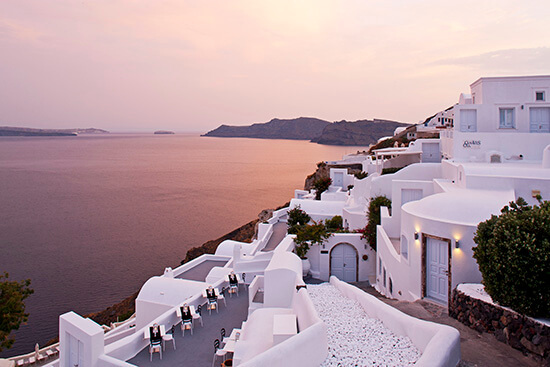 Think whitewashed towns and world-famous sunsets, accompanied by plenty of Mediterranean cuisine and a dash of ouzo. The Canaves Oia Hotel is my favourite; carved into the cliffside with sweeping views of the island, you can dine in private here on your balcony. The spa has been transformed from a 17th century wine cellar into a haven of pure bliss and serenity, and signature treatments use Elemis products. You can even embark on a wine tasting journey; unwind on one of the hotel’s private terraces as connoisseurs bring a variety of local tipples for you to sample as the sun sets. Oh, and did we mention the Superior Suites feature plunge pool Jacuzzis? Perfect for enjoying a drink beneath the stars. Sitting on the golden sands of Duque Beach, suites at this luxurious turreted resort are either ensconced in lush gardens or overlook the shimmering ocean. The Kids’ Club and Teen Lounge will keep children of all ages entertained, while you set sail on a yacht trip. I could happily while away an entire day at the spa, breathing in the intoxicating scents of the aromatic gardens while enjoying a treatment at the Thai Massage Room. The choice of eight restaurants and 13 bars means there is somewhere new to dine every night. Still not convinced? This hotel even has its own observatory, where you can gaze at the night sky. One of the most famous party hotels in the world, soak up the celebrity lifestyle at this adults-only resort, where the Anything Can Happen Suites have Jacuzzis on the terrace. 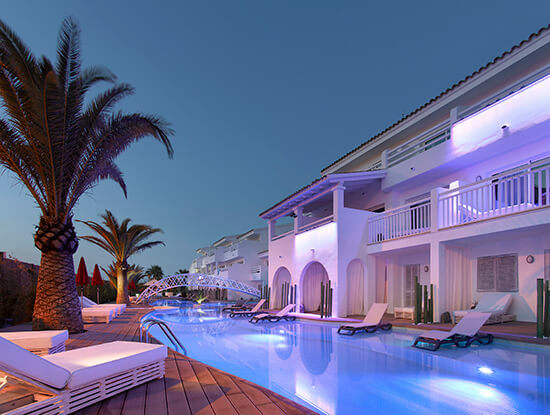 Relax on Ibiza’s most famous beach, Playa d’en Bossa, and soothe your senses at the achingly-cool spa. 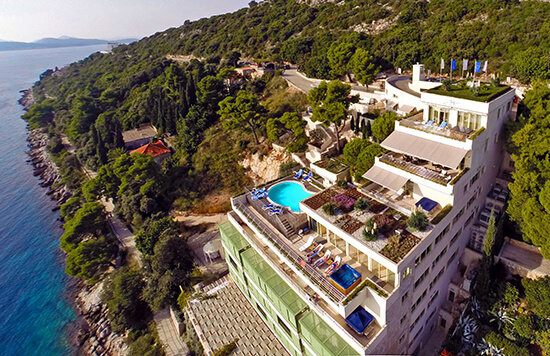 A stay at this hotel also means you can enjoy exclusive access to the best parties in town, where the world’s leading DJs perform. Experience life as a celebrity through the VIP Club Service; charter the hotel’s yacht, or arrange a table at the best restaurants in Ibiza. The shimmering pool is the main focus here, complete with underwater speakers, lighting and massage jets. If you’re looking for the perfect European Escape for all the family, this boutique haven is ideal. 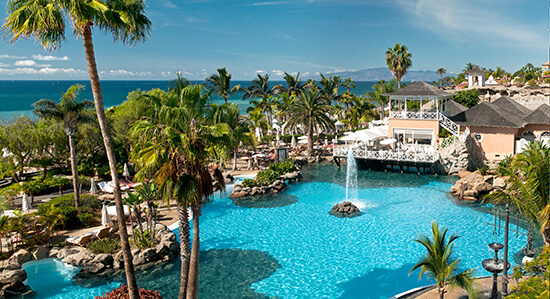 Steeped in rich history and sitting in subtropical gardens, the Deluxe Rooms offer unparalleled views of the ocean. Take your pick from three pools, or chill out at the spa while the kids make friends at the Fun @ Reid’s Club. Younger guests are even handed welcome teddies on check in. Experience gourmet cuisine at the Michelin-starred William Restaurant, and don’t miss the signature afternoon tea, where you’ll be invited to indulge in a chilled glass of Champagne and fresh cream scones on the terrace. You will instantly be struck by the classic Art-Deco design the minute you step foot inside this elegant hotel. Indulge at the L.Raphael Beauty Spa, where the Swedish massage is my top recommendation for sheer relaxation. The hotel’s private beach, Zplage, is one of the largest and most beautiful in Cannes; the perfect place to stretch out with a good book. 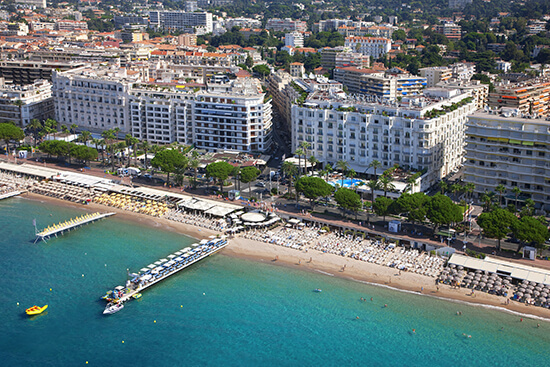 You will also find the only restaurant in Cannes with two Michelin stars at this hotel. Restaurant La Palme d’Or features a menu and design reflecting the world of cinema. Top of my list for 2017 is a trip to the Amalfi Coast, and while unfortunately my budget won’t stretch to this slice of heaven, I can dream! Formerly a 13th century monastery complete with internal cloister, the 53 elegant rooms boast picturesque cliff-side settings. The views from the infinity pool are spectacular; edged by a stone terrace, you can see out over the entire Amalfi Coast. I think I would spend the majority of my time here, or in the Turkish Bath on the 18th floor spa. What’s more, Japanese is one of my favourite types of cuisine, and acclaimed restaurant Kyushu specialises in this. Searching for a unique hotel? Here, you can enjoy a refreshing cocktail in Cave Bar More, which is concealed in a natural cavern and boasts a superb drinks menu – the perfect escape from the midday sun. With nautical suites and a fifth floor swimming pool and Jacuzzi, it could become difficult to tear yourself away from Hotel More. Overlooking the cascading cliffs of Lapad Bay, the setting is breathtaking. At night, the dining terrace is transformed into a candlelit paradise. 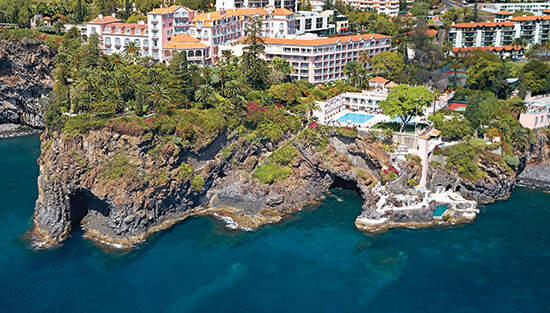 Flick through our new European Escapes brochure for some more hotel inspiration, or make an appointment with one of our Travel Experts to tailor make your perfect European holiday.